If you're in love with the 2020 Keystone Bullet 248RKS Travel Trailer, then stop on into RV World MI in beautiful Grand Rapids, MI! You'll save $1000s on this great RV, as well as all the other top brands we carry! We're RV specialists and we've been servicing RV enthusiasts in Michigan and everywhere for years! Come in today and see us at 7834 S Division Grand Rapids Michigan 49548 or give us a call at 616-591-3632! Our experienced sales people know all our brands top to bottom and inside out! We'll help you buy your dream RV at a price that will astonish you! Long travels are easy, with a GVWR of lbs, dry weight of 5235 lbs, and a hitch weight of 580 lbs. Kick back, relax, and enjoy the fresh air under the shade of the 15' 0" awning! 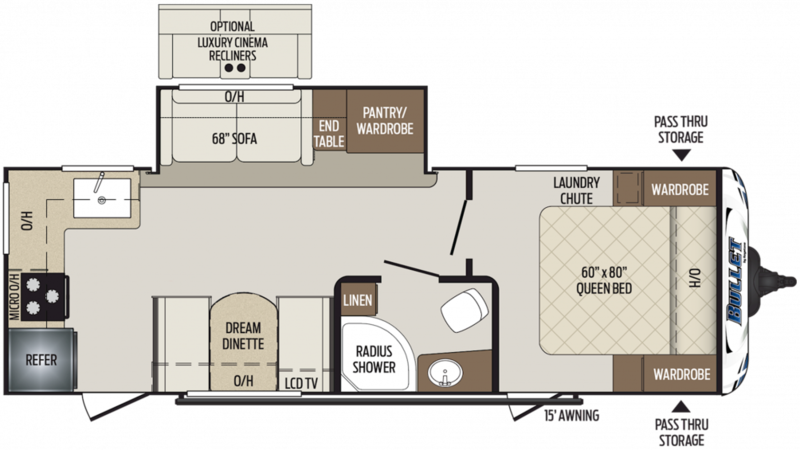 There is a wonderfully spacious Queen bed inside the master bedroom, perfect for a long, comfy night of peace and quiet on the road! There are enough sleeping accommodations for up to 6 people in this cozy camper! Make a home-cooked meal instead of going out to eat fast food! Inside the kitchen you'll find a 6.00 cu. ft. refrigerator, a 3 burner range cooktop, and more! The sink pours plenty of fresh water to clean, drink, and cook with, thanks to the 43 gallon fresh water tank!